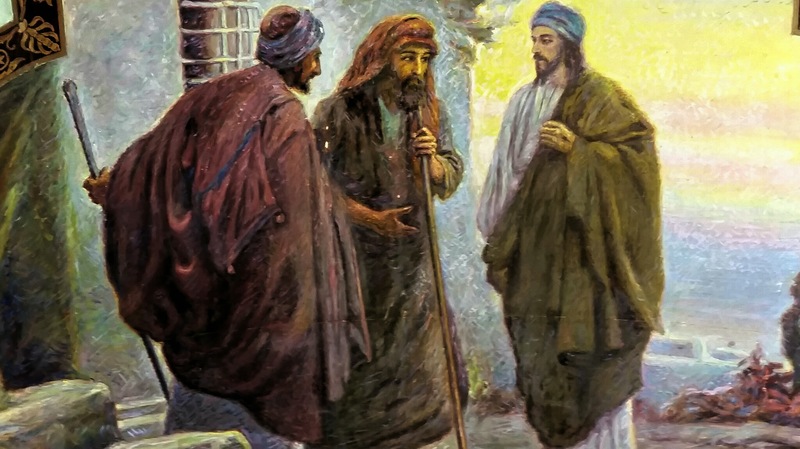 Who are ‘The Easter People’? 1 Language to learn. 2 Months. 3 learning sites and micro-climates. 12 hours of day and night. Over a dozen Churches where we received and adored Jesus. About 70 cups of local coffee. Hundreds of miles flown, driven and walked. 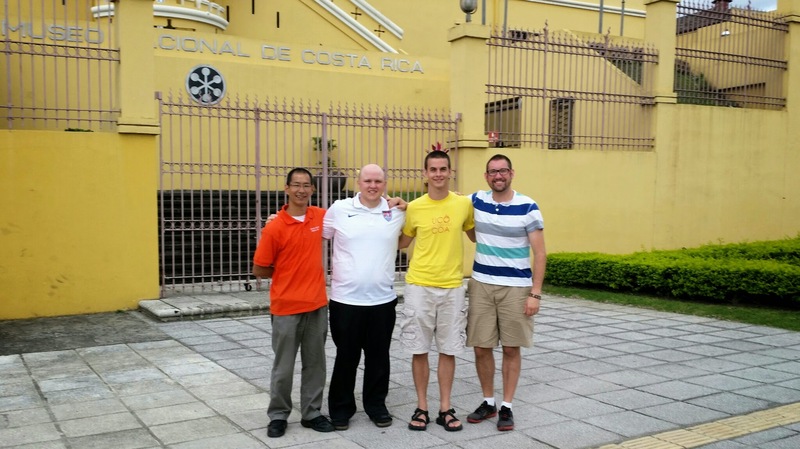 Thousands of experiences and memories with the Catholic Christians of Costa Rica. We had a purpose for traveling to Costa Rica. That purpose was to spend 8 weeks being immersed in the Spanish language. Through classes, through conversations and through daily attendance of the Mass in Spanish, we were planning to deepen our comprehension of the language. Now, here is a photograph I took which in a sense can sum up what really happened during our entire trip to Costa Rica. Don’t worry, I’ll explain. Painting on the ceiling of the parish of San Joachin in the town of the same name. That is the story of our whole trip in one image. Kyle, Stephen, Christian, and I came to Costa Rica both expecting certain things and also not knowing what to expect. Again and again we were surprised by how God was seeking to have encounters with us. In the teachers we met at the school, in the priests we came to know at local parishes, in the Mass (“the breaking of bread”). Jesus both continued with us and came near in so many unexpected ways during our entire 8 weeks in Costa Rica. There were specific instances that each of us could point to that seemed to overwhelmingly reveal that God was surpassing our expectations. These instances occurred in big and small moments. My other brothers on the trip can share their own and some of them likely overlap with mine. The walks throughout our entire time in Costa Rica were truly a blessing. We walked a lot. We walked alone (with God) and together. Some days we would average 3-5 miles of walking. Other days it would be more. We walked on the road, on the beach, in the mountains and in the city. We walked in the day, late at night, under clear sunny skies and when there was pouring rain. The soaking rain reminded me of my Baptism into Christ through the Church and how He wants to fully soak or immerse us with His life. These walks also gave time to prepare our hearts for prayer, to talk through the experiences we were having, and to ask Jesus’ blessed Mother Mary to pray with us and for us to her Son and our Brother. These walks all culminated in ‘the walk’ which I will share about a little later. The first week of our trip we were living on the Coast of Costa Rica in the town of Playa Flamingo. 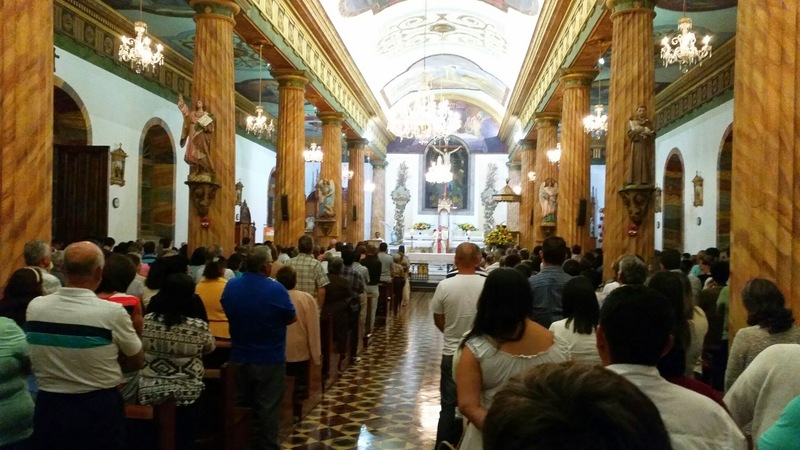 This was the most difficult time for us as we were not able to experience daily mass since the parishes were more spread out and there were not as many priests available in this more rural area. As we progressed further along in our trip Mass became more frequent. All this time though I was reminded again and again of the truly universal nature of the Church. While the Mass was being celebrated in a different language, the prayers and the readings from Scripture were the same that my Christian brothers and sisters in the USA were praying. It really highlighted the point that the Mass is the prayer of the whole Church throughout the world. It is not the preference of one priest or one country. It is not the worship of one time or place. It is the unifying prayer of Worship that has been prayed in the 20+ centuries since Jesus ascended to heaven. It has been prayed in hundreds of languages and it is where the one Sacrifice of Jesus on the cross is present and offered on thousands of altars around the world in every time zone. It is the place where everyone, everywhere may encounter the life, death and resurrection of Jesus. The place where Jesus comes intimately near in the supper of the Lamb. This reminder too was a blessing. On the second leg of our journey, in the small town of Santa Elena, in the region of Monteverde (Green Mountain), we had the wonderful opportunity to meet one of Jesus’ priests named Padre Juan Carlos. We had the chance to attend many Masses that he presided at and went on a few journeys through the mountains with him. 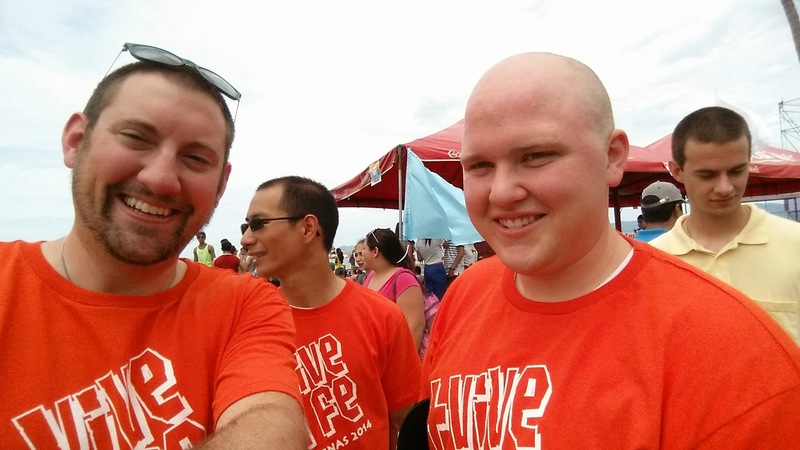 The more time we spent with him the more we were in awe of the way he was living out his priesthood. Without Jesus, I know it would be impossible for this man to do what he does on a weekly basis. 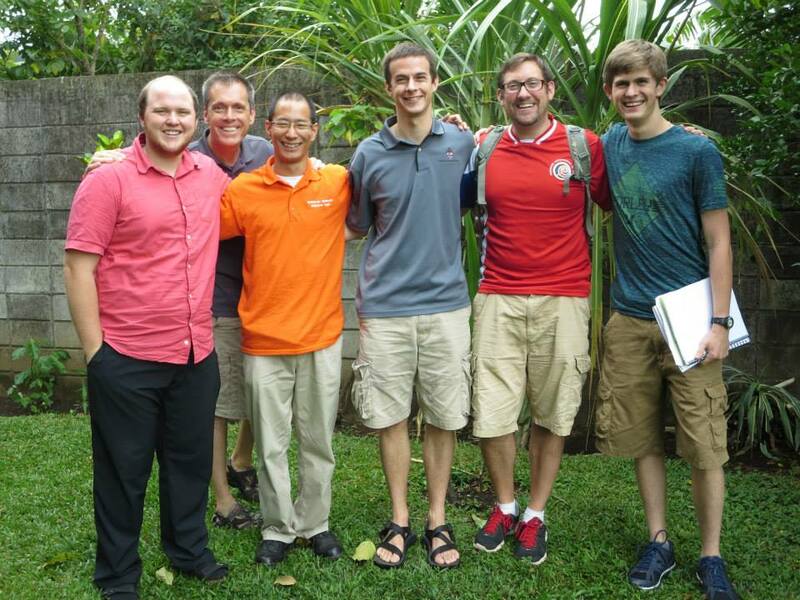 Right now, Costa Rica is in great need of an increase of vocations to the priesthood. Things are starting to look better, but if you can, please pray for this intention. Padre Juan Carlos is responsible for saying mass at about 15 parishes. These parishes are not only quite a distance from each other, but also each one has a vibrant faith community. In the U.S. some places have needed to combine parishes to make it possible for a priest to serve the community. In places such as Monteverde, that is not an option. Most peoples at these different parishes only have walking as transportation and the distance between the surrounding towns could not be walked by the young and those more advanced in age. In the midst of this reality, Padre Juan Carlos invited us on many occasions to experience these faith communities with Him and to be a part of their celebrations of the Mass. In addition he also took us to visit some of the families in the parish where we shared a cup of coffee and conversation. On two occasions, Padre also cooked a meal for us at his home and it was some of the best cooking we experienced on the trip. We would later return to Monteverde on a weekend trip to experience something else with Padre that I will talk about in a moment. In the provinces of Monteverde and Heredia we had opportunity to experience the weekly practice of adoring Jesus in the Blessed Sacrament. Jesus has promised to remain with us always and the Eucharist is a special way that the Church experiences this reality. The community sings beautiful hymns and songs to Jesus, Scripture and reflections on Jesus are read, and people bring prayer for their families, their community, their country and the world. These times with Jesus were such a blessing which we were surprised and amazed to encounter. After arriving at our final school location of Heredia, we soon discovered that a priest from the state of Florida was also attending the Spanish immersion school. For the next two weeks we had opportunity to help serve at the Mass after our classes each day at a nearby chapel. This was another unexpected blessing. Father Bill was able to offer the Mass in Spanish to the community that lived near the Chapel of the Blessed Trinity. Meanwhile, we were able to form a friendship with Father Bill and hear about his experiences as a priest back in the United States. A second amazing experience occurred while this was going on. 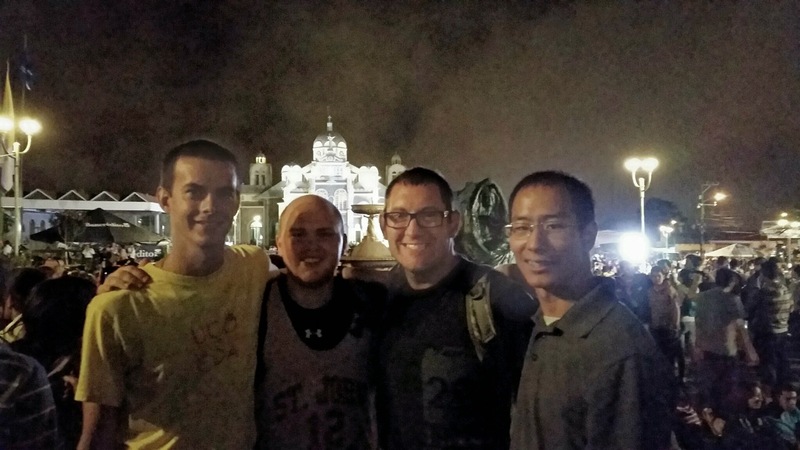 A young man from the state of Texas who was close to finishing high school began attending the daily Mass with us. While this young man was not Catholic, he was very open to experiencing the Mass and the life of faith found in the Catholic Church. Also, the Costa Rican family he was staying with was close to the family where Father Bill stayed. We had many wonderful conversations about faith together. Pray for this young man. We expressed to him that while he is not yet Catholic, we felt he may have a vocation to the priesthood one day. As I mentioned earlier, we decided after leaving the area of Monteverde, that if we had the chance, we would like to return during one of our weekends after we had moved to our final location of Heredia. We found an opportunity to return after we had been staying in Heredia for two weeks. We would be returning to see the friends we had made and to stay at the home of Padre Juan Carlos. But, our journey would take us further than we had expected. It turns out on this same weekend we decided to return to Monteverde, Padre Juan Carlos asked if we would like to attend the national Catholic youth conference in Punterenas (Sand Point). We were more than happy to go. This was essentially a localized World Youth Day. About 20,000 Catholic youth came together on the coast of Costa Rica and celebrated the Mass together. There was music, food, and joyous festivities. One unexpected outcome was that all three of us were badly sunburned. Each of us forgot to bring our sunblock on this day trip and we all left that day very red. Even in this, we were reminded of God’s goodness. Just as in staying exposed to the physical sun for too long results in sunburn, so too long exposure to the presence of God’s Son exposes our hearts to His consuming fire of love. In 1635, in the city of Cartago a little girl, who was gathering wood, found a small stone carving of Mary holding the infant Jesus. She brought the stone back to her home and on the next day, while out gathering wood again, she found the same carving in the same place. She was surprised to find what she thought was another carving. She again brought it back to her home. To her surprise, the carving she had brought back the previous day was not in her home. This happened a few more times. Being confused and thinking someone was playing a trick on her, she brought the stone carving to a local priest. The priest placed it in his own home and the next day he discovered the carving was missing. The priest found the girl and asked her to take him to the place she found the carving. They went together and there again the carving was where it had been the previous times. The priest brought it back to his house and this time decided to lock it in a box, thinking someone was playing a trick on both he and the girl. The next day, he unlocked the box and the carving was no longer inside! He went back to the place where the carving had been first found by the girl and there it was again. The priest brought this to the local Bishop of Cartago and they interpreted this as a request of God to have a Church built where the carving was found. Throughout the past four hundred years, thousands of confirmed miracles have been connected to the prayers offered here in this place and with the water of a natural spring that was discovered at the base of the rock where the carving was first discovered. In 1983, Pope John Paul II visited this holy place. And, just this year, the canonization to sainthood of Pope JPII was confirmed based on a recent miracle attributed to the intercession of the Pope and Jesus’ blessed Mother. A woman from Cartago with an incurable brain tumor asked JPII and Jesus’ blessed Mother to intercede for her. The women returned to the doctor and the tumor had disappeared with no natural explanation able to be provided. 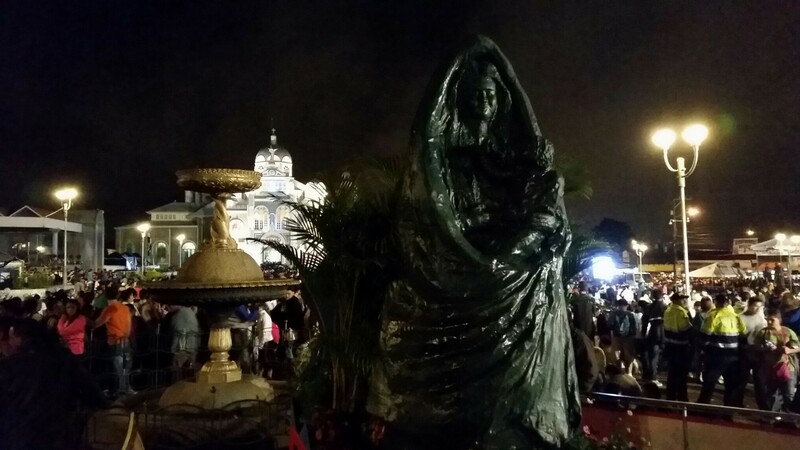 The name given to the carving is “La Negrita” (in English this translates as the Black Virgin or the Black Stone). This image of Mary with Jesus is currently in the Basilica of Our Lady of the Angels. By clicking the above image, you can experience a very special moment on our pilgrimage when our group broke out into a song I introduced to you earlier in the post, titled ‘Alma Misionera’. You really get a sense of what an amazing experience the pilgrimage was by watching the brief video I link with the image above. For each of us, the pilgrimage likely takes on its own personal meaning. But, it was the first pilgrimage each of us had ever walked and we walked it together. We walked it as brothers in Christ. The first family I stayed with was a husband and wife who had two adult sons who no longer lived at home. They had had a daughter but she died not long ago at the age of 18 of Leukemia. The first day I was given a tour of the house and I noticed their family picture. I asked about their children in the photo and this is how I discovered that the daughter pictured had died. While I knew the mother continued in her faith, I learned later that before I had come the father had been deeply hurt by the loss of his daughter and had not gone to Mass for quite some time. I also learned that their younger son also wrestled with his faith after he lost his sister and had not been to Mass for quite awhile as well. On one particular weekend while I was staying at the home, the younger son returned home and it turns out he had lived in the United States for quite some time. He could also speak English very well and we soon struck up a conversation. We talked about his struggles and how his faith had been shaken after his sister died. We talked for a couple hours. At the end of our talk he thanked me for taking the time to talk through a lot of things he had been thinking through for a long time but never put to words. I wanted to share a few of these brief moments that I had with my family because it reminded me of how God ordains the times and places of our lives. 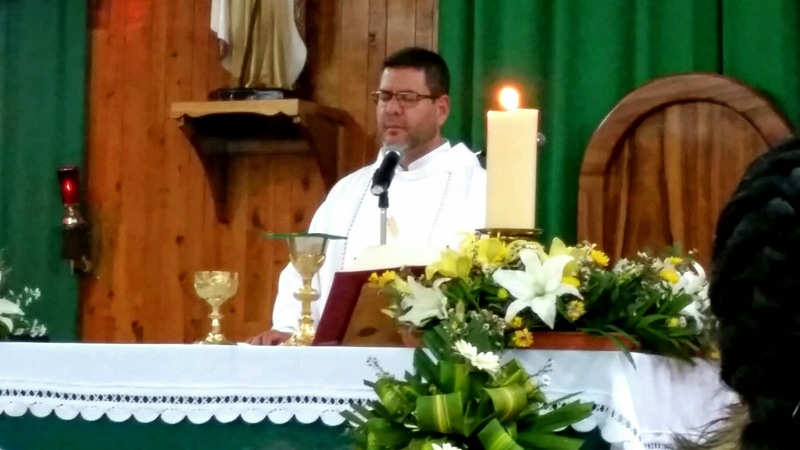 When we returned to Monteverde a few weeks later to visit with Padre Juan Carlos, I learned that the father who had not been coming to Mass, had come back and had attended Mass recently. These experiences reminded me that God is guiding our plans and opens doors for people to encounter His love on a daily basis, even during some of the most difficult times in our lives. Costa Rica has a lot of the same struggles that we have here in the U.S. There is a great need for more vocations to the priesthood. Many people are becoming turned away from faith and are trying to fulfill their desires through materialism and technology. The lives of families are under spiritual attack with many young people not receiving a good example of faith from their parents. But in the midst of all this, I can still rejoice in so many ways we saw God actively at work in the lives of so many Costa Ricans. Toward the end of our trip, before the pilgrimage, we had the opportunity to visit a group of 46 first year seminarians in the province of Alejuela. I believe sharing a photo and a short video from this visit is the best to conclude this reflection on our immersion trip to Costa Rica. May the Lord bless you all as you seek to be more and more immersed in the life of the Son of God, Jesus Christ! Virgin of the Angels, pray for us!